The post I originally replied to implied the person had no SD card and was using the internal 30GB..so yea don't think just copying works then. Hey new Switch owner as of Black Friday, waiting with baited breath for Smash. Picked up Mario Tennis and as a big SNK fan I snatched up some of the ACA Neogeo games from the eShop. I enjoy the controller that comes with the system just fine for the fighting games, but is there any Switch controllers I should look out for that are great for these old fighters? I personally love using the Hori Real Arcade Pro. arcade stick, as I can use that for the old school arcade games and any 2D fighter that has been released on the system, such as Dragon Ball Fighter Z. It's also compatible with PC, so you have that option if you choose. Is there like a site that lists resolution/target framerate of available switch games? shits annoying to look up. 2FA is asked when you change regions, it's a location based challenge. About to switch to a 400GB SD card - so I just copy everything onto PC, format the new card in the switch then copy back across? Don't do it like me and test the transfer from system to system idea, then re-download all the games. lol Bad idea lol. Followed the instructions but the new card says ‘unreadable’ on the switch. Formatted in the switch. This is it. I remember people having same issues with macs until they used a windows OS/PC. Are you sure it's not like the 3DS instructions where you copy from OG SD to PC. New SD is formatted. Copy/move all the data to New SD, and when its done just put it inside your Switch? Just copy everything from your old SD card to the new one, no need to format anything on the Switch in between. Edit: Oh you're on Mac, that's different. Game saves are always on the system. I've been 100% digital since Day 1 and use my Switch's internal strictly for saves without problems, even with games using large saves (NBA2K has 6GB each). Shouldn't be; I use Macs and I did it without any problems. Hey all. 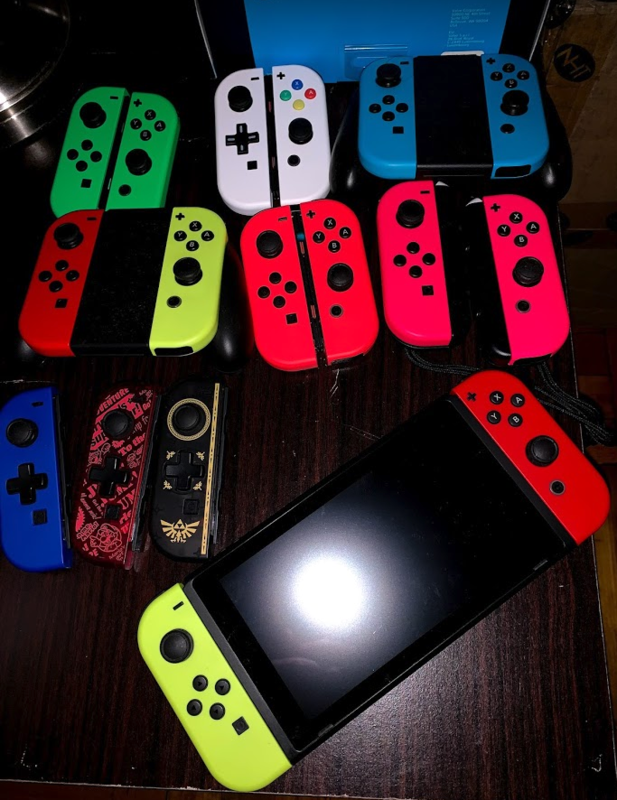 I have the joycons and a pro controller, but my wife and I recently made friends with another couple that are into gaming but dont have a switch yet. We were looking into another cheap but good alternative, they have two kids as well. So we can do split joy cons, pro and a new controller or two. We were looking at the Power A wired controllers that they have at gamestop for $15 and figured we can nab two or so. But we also don't want shite quality-- Are these good alternatives? This is for smash coming up, by the by. Thanks in advance. There's unfortunately no way to simply transfer already downloaded content from the Switch to the mSD directly. Why is Hyrule Warriors such a big game? It is like double the size of any other switch game I own. I'm trying to buy some games online on my computer at the eShop, but it looks like I can't buy anything unless I have a Switch connected to my Nintendo account? IIRC that is indeed the case, I'm afraid. Do you have any friend/family/others with a Switch who you'd trust with your account details? You could ask them to register your account on their system for the time being, so that you could then make the purchases that you're considering. I got Rocket League since that was on sale. What a decent port, it's ugly but it plays so well. I don't even care it's a jagged mess! For the first time ever when I grabbed my Switch, it said the Joy Con batteries were low. Granted I have not picked it up in weeks, so was it just it was not properly seated on the dock? I took them off, put them back on, put it on the dock on the green charging light is currently on (the main console itself was at 100% charge), so is this just a thing that happens from time to time or is there something else I should be aware of? Have basically owned it since a few weeks after it launched. Perhaps that's what happened. My 'cons also behave strangely sometimes. My left one's battery will get lower and give me warnings while attached to the console in handheld mode — it'll be in red battery range, while my right one is full. I've been having sd card troubles lately on my switch. Now the system won't read the card at all. Won't play like 90% of my games, won't download any patches. All of my data between the built in harddrive and sd card is less than 32gigs. What do I do? I can't transfer any data from the card to the harddrive because the card is corrupted or something. How am I supposed to save all my save files on the card? I can redownload games and reinstall patches of course, but I want to save my files. But I've also just read something about third party batteries with Power Delivery potentially damaging the console. Does this one look fine? You should be fine. Well, in terms of game saves at least. Game saves aren't stored on the cards. They are always stored on the Switch itself (and in the cloud if you subscribe to online). So all you would lose is game data that you can download again as you said. If you have screenshots you want to save, have you tried accessing the card on a computer? Do the MyNintendo gold points have a use on the Switch, or are they just used for 3DS/Wii U stuff? You can convert them to money basically. You can use them as discount on any game. One point is one cent. You get 5% worth of gold coins of every digital purchase price. Retail games also give you some. If you buy a game from eshop at 60 dollars/euros you get 3 dollar/euros back to use as a discount on other games. I bought a Skull gripcase but couldn't get the case that comes with it. Does anyone know of another case that will fit the Switch with the Skull gripcase attached? I haven't had any trouble with mine. However, they don't have motion control and don't have rumble. But I also only use them for 6 player board games, like Monopoly. So it appears my Switch has to be put in the Dock at a very specific angle now to actually charge everything. It does not make a whole lot of sense to me as I have not used it all that much especially in handheld mode (I have a Pro Controller so usually play it docked). Maybe I just need to clean the dock or something. I suppose that is always a possibility. Just figured I would share since you said you are seeing a similar issue. I realized my issue as I was placing it in the dock but the green status light was not coming on. If I place it a specific way it does come on indicating it is charging. Both of my joy cons got back to 100% within an hour or two. This is probably a dumb question, but are pack-in Switch Joycons (like, the ones that come with a console) swappable between systems? Because the left joycon on my brand-new Switch is completely borked, with the triggers and - button not responding at all. I'm trying to figure out if I can just exchange from the store instead of going through Nintendo's repair process. Huh, definitely try giving it a cleaning. If that doesn't work, you might try contacting Nintendo and seeing if they'll replace it if it's defective. My issue seems to be related to the joy-cons themselves, since there's no issue with them charging when docked. The left one'll sometimes just... inexplicably lose charge while in handheld mode, while the right one doesn't. Yeah, joy-cons can be interchanged between systems. Nintendo will definitely replace yours for free, if you need to go that route. So I just changed the country in my NNID in order to change the Eshop region, and it was the easiest thing in the world, even with Nintendo's barebones online experience. I wonder why Sony can't implement the same thing. You can have multiple regions. I have the US and Japan. On both my Switch and my PS4. In PS4 not without making a new user. I have three accounts for Argentina, US and Japan on PS4. My PS+ is linked to my US account since Argentina didn't even have a Store when I bought my PS3. If you buy a year of online for $20 using eshop funds, do you have to associate an alternate payment method? Yea I only have those two. For switch because no eShop exists where I live, we get everything Japanese physically - even those Japan Only Items too. Also get some NA stuff, but Japanese swag is way nicer. I vastly prefer the profile system, especially on the switch it is easier to select then the PS4. Also switching within a single profile on the switch region you lose those digital funds. Hopefully I can get their CS to fulfill the lower price. Ouch. If they don't to it via chat, call them. Much easier to deal with on the phone and much more accommodating. I spoke to a rep via chat, and he said to place the order again, and he would refund the difference in price once the order had successfully shipped. Hopefully nothing else goes awry, because I'm going to be pissed if I actually spend $155 on what should have been $80. Well, good on them for doing the right thing. Picked up the 8Bitdo N30 Pro2 on Amazon Flash sale. All of the reviews and youtube videos I have seen on it speak highly of it. $50 eShop card bought for $45 off eBay. $60 - $50 from funds - $10 additional funds charged to my credit card. Redeem 300 coins with $55 spent. my turn for a question: if I get a new switch, is there any way to transfer my old save information from my old switch to my new switch (but same nintendo account), or am I outta luck? Yes, there is a tranfer procedure built-in if you have both the old and new Switch. On order - Gray set (hate these but good price on Amazon yesterday), Let's Go set, Smash set, NES set, Famicom set, Pikachu Hori dpad. Some would say I have a problem. They would be right... but also far less FABULOUS. I challenge you, PeerIGN!